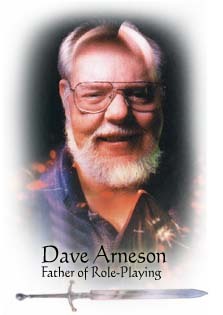 I’m pleased to announce that on Saturday, March 27th we will be celebrating Dave Arneson’s seminal contributions to adventure roleplaying by getting together and playing games in his honor! This date is chosen to fall at the conclusion of the International Traditional Gaming Week, organized by TARGA, the Traditional Adventure Roleplaying Game Association. The week begins on March 21st with GaryCon II, which I’m also excited to be part of; I’m very happy to have the ITGW bracketed by events remembering these two sadly departed heroes of the polyhedral dice. Games will begin at noon and wrap up at 5, to allow time for cleanup before the store closes at 6. I’m hoping we will once again have a variety of games, since Arneson’s legacy reaches beyond Dungeons and Dragons and encompasses all of us who like to get together with friends and imagine that the fate of our imagined adventures will be determined by the roll of a dice. If you’d like to run a game, just send an email to arneson.gameday@gmail.com with the title of your game, the minimum and maximum number of players, and a brief description. I’ll post mine in a week or two as an example. If you’re in travel distance of NYC, I hope to see you on 3/27/10! If you’re too far-flung, why not run a local event during the International Traditional Gaming Week? Let me know what it is, and I’ll add it to the list of ITGW events.